How is an almond harvested? Harvest is in full force on the farm. We started shaking about two weeks ago and now we are sweeping and picking up almonds. 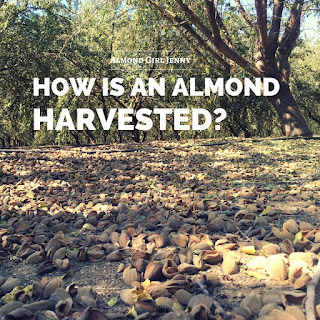 After we shake almonds, we leave them on the orchard floor for 7-10 days to dry. 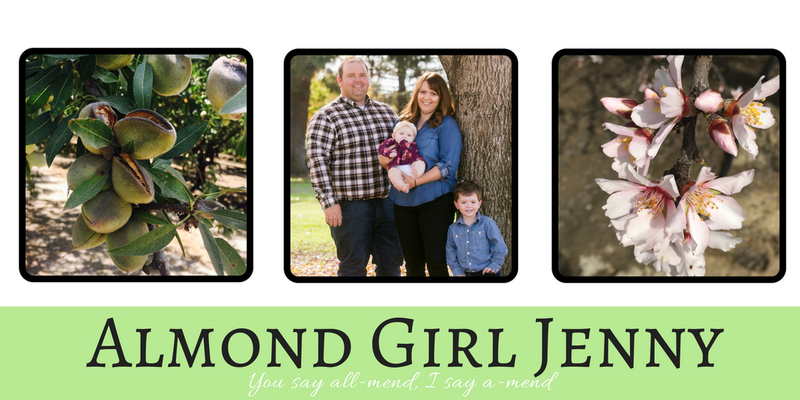 Almonds have a pretty high moisture level on the tree and it takes a while for mother nature to dry them out. When they are dry enough we start sweeping. A sweeper is a self propelled machine that is low to the ground, has brushes out in front and a blower to the side. The sweeper blows the nuts from the tree line to the orchard row and the brushes then sweep the almonds into what is called a windrow. The windrows make it possible for the harvester to come through and pick up the nuts. The harvester gets pulled by a tractor through the orchard and carries a reservoir cart. The harvester picks up the almonds from the windrow and does an initial cleaning of dirt, leaves, rocks and other debris. 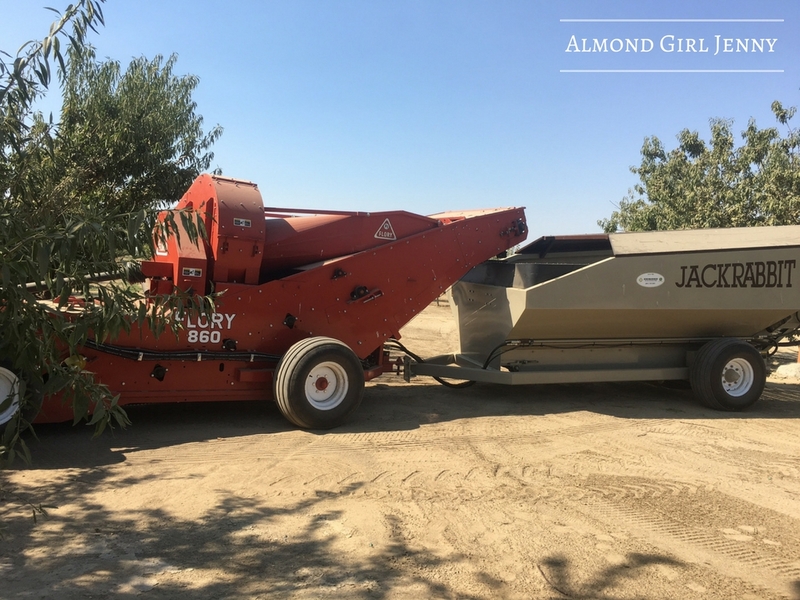 The harvester then dumps the almonds into the reservoir cart. This is one steady motion through the field. 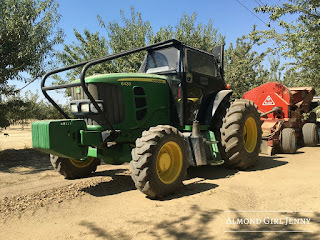 The tractor continues to drive up and down the orchard rows and picks up the almonds as it drives. Once the reservoir cart is full of almonds a shuttle cart comes up behind it. You will notice the reservoir cart and the shuttle cart are made by the same manufacturer. These two pieces of equipment typically are the same manufacturer so the machine clearances line up correctly. 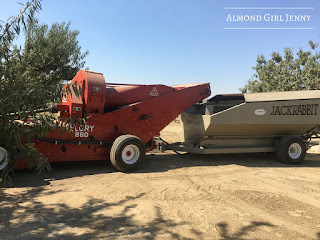 The reservoir cart has to dump the almonds into the shuttle cart and you don't want to loose any almonds from the equipment not lining up properly. The augers inside the shuttle cart and reservoir cart help to distribute the almonds across the carts to maximize the storage capacity of the trailers. The shuttle cart then drives to the elevator to unload. The shuttle cart ensures the harvester doesn't have to slow down to pick up almonds. 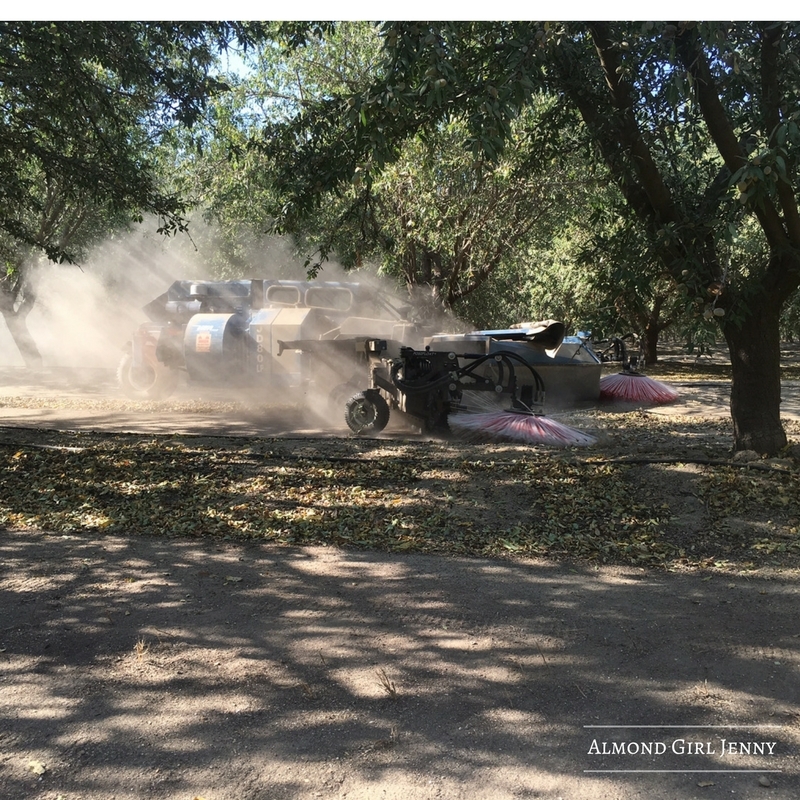 While the shuttle cart is unloading almonds at the elevator the harvester continues to pick up almonds. It is a fast and efficient process. So when the shuttle cart gets filled up it drives to the elevator and pours the almonds into the elevator trough. The trough belts then carry the almonds up the elevator and into the semi trailers. There is a desticker attachment that is part of the elevator as well. The attachment will remove the large sticks and branches that may have got picked up with the almonds. Once the trailers are full of almonds they head off to the huller and sheller for further processing and into a store near you! Interesting update Jenny !! 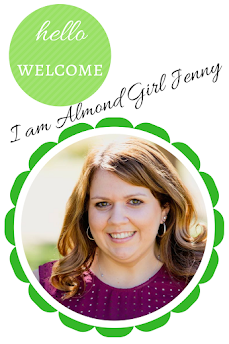 Its awesome to learn so much about Almonds while not being in California. Why AB1066 is bad for California agriculture.